While Frank Hamrick, an associate professor of photography, lectures on making art, he hopes to demonstrate what he teaches at Louisiana Tech University to help artists understand they can pursue a college degree and career. One of Arden Kennedy’s classes holds up examples of their work. 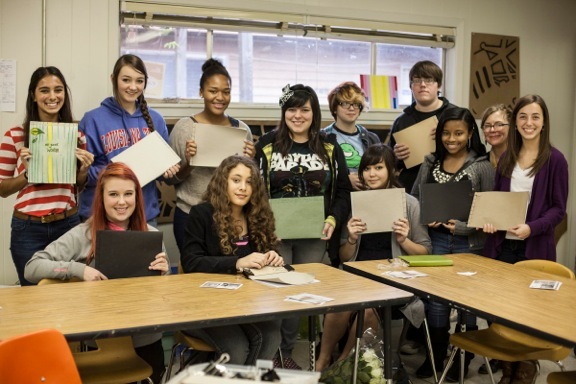 Frank Hamrick, an associate professor and photography area coordinator for the School of Art at Louisiana Tech, conducted bookmaking workshops with three of Kennedy’s art classes. Hamrick lectured and taught Arden Kennedy’s art classes at Caddo Parish Magnet High School in Shreveport how to create book structures, content and how to combine both to create a successful piece of work. Kennedy said the program was excellent for the students because they were able to be creative, while also learning how to work effectively. Kennedy said the lecture gave her students a lot of insight on how to make something and tell a story in their books. Hamrick said students started from the beginning by coming up with an idea and ended by sewing the books together themselves. “I believe it is empowering for a person of any age to be able to say, ‘I made this,” Hamrick said.